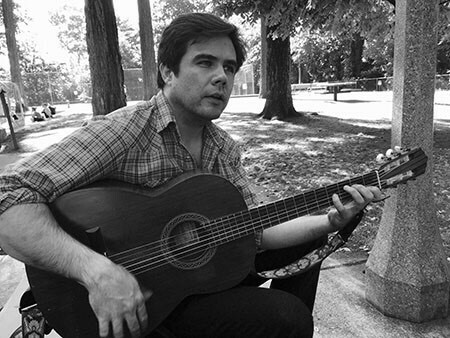 Joel Swensen is a Portland, Oregon based songwriter who creates introspective pieces that dive deep into subjects of exhaustion, anxiety and pain with a lulling elegance. His newest album ‘An Unremarkable Pair of Lungs' is a collection that was put to tape in 2009 but took seven years to reveal when Joel was diagnosed with cancer. As if he dog eared the best pages in the books of Nick Drake, Jose Gonzalez and Sufjan Stevens, this ten song collection of mostly finger-style guitar songs leave a profound impact without the help of modern recording techniques. It's like an album made in a bedroom by a person who's known the language of music all their lives. Now as a healthy survivor, Joel is ready to release ‘Lungs' under Fresh YO! Label and start picking up where he left off so many years ago with kind of touring and writing so many people take for granted."